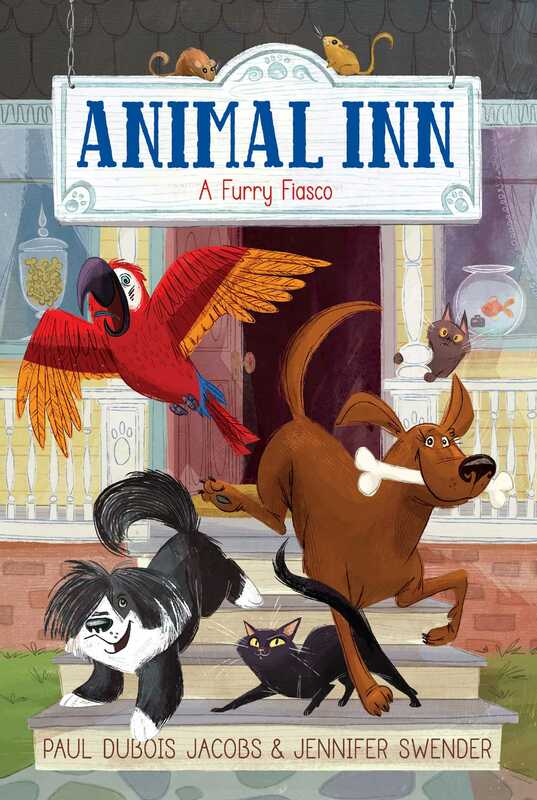 Play and stay at the Animal Inn, a brand-new chapter book series where the fur—and fun—flies at an animal spa and hotel. When the animals hear that a new boarder—a Komodo Dragon—will be coming to the Inn, they panic! Is it a fire-breathing dragon? Will it gobble them all up and then devour their family? What’s to become of the Animal Inn? It began like any other Saturday morning. Saturday is a busy day at Animal Inn. Mom teaches her Polite Puppies class. Dad and Jake host the Furry Pages. That’s when children read aloud to an animal buddy. And there are grooming appointments and usually a birthday party or two. On this Saturday morning I was on my perch in the Welcome Area. Dad was tidying up the brochures. Mom was talking on the phone to an old friend from her dog show days. Fiddlesticks. Fuzzy and Furry must have escaped again. Fuzzy and Furry are experts at picking the lock on their gerbiltorium. They usually escape at night, when guests are safely tucked into their cages, crates, tanks, and stalls. I was a bit worried that Fuzzy and Furry might run into the new guest on the third floor—a boa constrictor named Copernicus. “Stop telling me what to do!” Ethan shouted. “Ethan! Start looking!” Jake shouted again. “You’re not the boss of me!” Ethan shouted back. Mom rushed up the stairs. Luckily, the gerbils had not bumped into Copernicus. They were found in Jake and Ethan’s laundry hamper, fast asleep. A few minutes later Cassie came downstairs, followed by Coco. Shadow is supposed to be an indoor cat, but she loves to sneak outside. Cassie and Coco are her best chance for a little adventure.